He was the son of George Frederick Sawyer and Naomi Woodbury Babson. Edson married Constance Mable Covell. Massachusetts Vital Records, 1841-1910, , Vol: 544 ; Page: 89. 1910 United States. Bureau of the Census. 13th census, 1910 population census schedules, Washington, District of Columbia: Bureau of Census Micro-Film Lab, ([19--?]) , Census Place: Norton, Bristol, Massachusetts; Roll: T624_574; Page: 11A; Enumeration District: 0220; ; FHL microfilm: 1374587. Social Security Death Index, at http://www.ancestry.com/ssdi/advanced.htm, EDSON SAWYER 22 May 1904 30 Oct 1988 02889 (Warwick, Kent, RI) (No Location Given) 037-05-3943 Rhode Island Before 1951. GEDCOM File of Carolyn L Upchurch, 4703 SE 36th Pl, Portland, OR 97202, online http://www,ancestry.com, (132892.ZIP), prepared 25 MAY 2000. 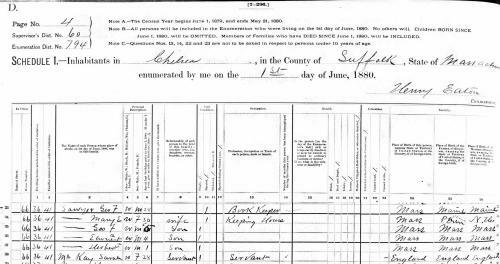 "New Hampshire Birth Records, Early to 1900," database with images, FamilySearch (https://familysearch.org/ark:/61903/1:1:FLP6-V5T : 12 December 2014), Elisha Smith Sawyer, 19 Dec 1808; citing New Hampton, Belknap, New Hampshire, United States, Bureau of Vital Records and Health Statistics, Concord; FHL microfilm 1,001,045. Mass. Newbury, Vital records of Newbury, Massachusetts, to the end of the year 1849 (Salem, Mass. : The Essex Institute, 1911), p. 463. He was the son of George Frederick Sawyer and Mary Elizabeth Carleton. Sawyer, Ernest A (Martha B) letter carrier West Somerville P O. house 14 Charnwood rd. Sawyer, Ernest A (Martha B) letter carrier West Somerville P O. house 99 Pearson av. Sawyer, Ernest A (Martha B) letter carrier P O. house 6 Chandler. The census of 1930 shows: Ernest Sawyer, 53, letter carrier for the government, and a Philippine–American War veteran; listed with Charlotte Sawyer and Ernest Sawyer Jr.
Massachusetts Vital Records, 1841-1910, , Vol: 279 ; Page: 79. 1880 United States. Census Office. 10th census, 1880 federal population census, Washington, District of Columbia: National Archives and Records Service, ([19--]) , Census Place: Chelsea, Suffolk, Massachusetts; Roll: 562; Family History Film: 1254562; Page: 411D; Enumeration District: 794; Image: 0344. "Maine, Vital Records, 1670-1907 ," index and images, FamilySearch (https://familysearch.org/pal:/MM9.1.1/KCDK-GPR : accessed 22 Nov 2012), Ernest Alexander Sawyer and Matha Belle Barker, 1906. 1910 United States. Bureau of the Census. 13th census, 1910 population census schedules, Washington, District of Columbia: Bureau of Census Micro-Film Lab, ([19--?]) , Census Place: Somerville Ward 3, Middlesex, Massachusetts; Roll: T624_604; Page: 4A; Enumeration District: 0998; ; FHL microfilm: 1374617. Unknown author, "Additions to the Museum Collections March 1, 1913 - March 2, 1914," Bulletin of the Society for the Preservation of New England Antiquities, Vol. 5, No. 1 (April 1914): p. 30. 1920 United States. Bureau of the Census. 14th census, 1920 population census schedules, Washington, District of Columbia: The National Archives, ([193-?]) , Census Place: Somerville Ward 7, Middlesex, Massachusetts; Roll: T625_718; Page: 3B; Enumeration District: 455; Image: 396. 1930 United States. Bureau of the Census. 15th census, United States, 1930 federal census : population schedules ; NARA microfilm publication T626, Washington, District of Columbia: Bureau of the Census Micro-Film Laboratory, ([19--?]) , Census Place: Somerville, Middlesex, Massachusetts; Roll: 928; Page: 5B; Enumeration District: 453; Image: 886.0; FHL microfilm: 2340663. Massachusetts. Boston, Passenger Lists of Vessels Arriving at Boston, Massachusetts, 1891-1943. Micropublication T843. RG085. Rolls # 1-454, Washington, D.C.: National Archives, , 1936 > September > President Hayes > 1. "United States Census, 1940," database with images, FamilySearch (https://familysearch.org/pal:/MM9.3.1/TH-1942-27889-6627-61?cc=2000219 : 11 July 2014), Rhode Island > Providence > Cranston City, Cranston, Ward 1 > 4-44 Cranston City Ward 1 bounded by (N) Park Av; (E) Broad; (S) Pawtuxet River; (W) Warwick Av > image 15 of 28; citing NARA digital publication T627 (Washington, D.C.: National Archives and Records Administration, 2012). living at 66 Grove Street, Chelsea, Massachusetts. Massachusetts Vital Records, 1841-1910, , Vol: 264 ; Page: 182. 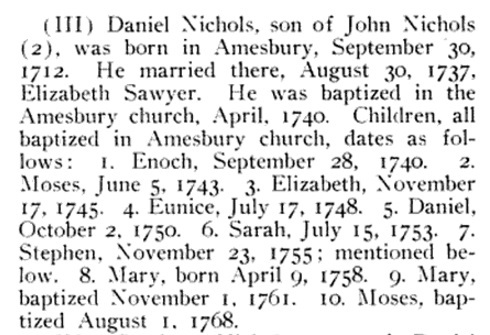 "Massachusetts, Deaths, 1841-1915," index and images, FamilySearch (https://familysearch.org/pal:/MM9.1.1/N4X9-ZP8 : accessed 11 Nov 2012), George F Sawyer, 1915. Massachusetts Vital Records, 1841-1910, , Vol: 270 ; Page: 110. 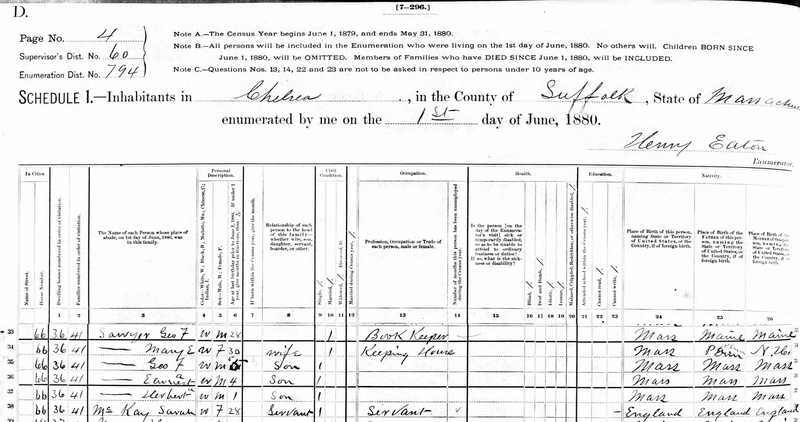 "Massachusetts, Births, 1841-1915," index and images, FamilySearch (https://familysearch.org/pal:/MM9.1.1/FX7L-YNR : accessed 10 Nov 2012), Gracie May Sawyer, 1880. In 1919, George Frederick Sawyer was president and treasurer of Improved Seamless Wire Co. He was also president of the Electric Chain Co., treasurer of Manufacturers Refining Co., and a director of the Industrial Trust Co., in Providence. living at Norton Centre, Massachusetts. living at 32 Fort Ave., Cranston, Providence County, Rhode Island. Massachusetts Vital Records, 1841-1910, , Vol: 491 ; Page: 365. 1900 United States. Census Office. 12th census, 1900 population census schedules, Washington, District of Columbia: Bureau of the Census Micro-Film Laboratory, ([197-]) , Census Place: Braintree, Norfolk, Massachusetts; Roll: 668; Page: 17B; Enumeration District: 1014; FHL microfilm: 1240668. National Archives and Records Administration (NARA); Washington D.C.; Passport Applications, January 2, 1906 - March 31, 1925; Collection Number: ARC Identifier 583830 / MLR Number A1 534; NARA Series: M1490; Roll #: 368; ; . Passenger and Crew Lists of Vessels Arriving at New York, New York, 1897-1957, Washington, D.C.: Records of the Immigration and Naturalization Service; National Archives, , Year: 1928; Arrival; Microfilm Serial: T715; Microfilm Roll: 4237; Line: 24; Page Number: 251. Frederick Adams Virkus, The Abridged compendium of American genealogy : first families of America : a genealogical encyclopedia of the United States / edited by Frederick A. Virkus under direction of Albert Nelson Marquis, Chicago: A.N. Marquis & company, (1925-1942) , Vol. 5, p. 472. "Rhode Island, Deaths and Burials, 1802-1950," index, FamilySearch (https://familysearch.org/pal:/MM9.1.1/F8HG-DSZ : accessed 23 Nov 2012), George Frederick Sawyer, 1876. Massachusetts Vital Records, 1841-1910, , Vol: 568 ; Page: 88. Social Security Death Index, at http://www.ancestry.com/ssdi/advanced.htm, GEORGE SAWYER 24 May 1907 Apr 1983 02852 (East Greenwich, Kent, RI) (No Location Given) 037-05-3939 Rhode Island Before 1951. Harold Babson Sawyer was graduated in 1922 from Wentworth Institute. Massachusetts Vital Records, 1841-1910, , Vol: 498 ; Page: 10. Frederick Adams Virkus, The Abridged compendium of American genealogy : first families of America : a genealogical encyclopedia of the United States / edited by Frederick A. Virkus under direction of Albert Nelson Marquis, Vol.5, , at https://books.google.com/books?id=mUdnAAAAMAAJ . Chicago: A.N. Marquis & company, (1933) , p. 472. Social Security Death Index, at http://www.ancestry.com/ssdi/advanced.htm, SAWYER, HAROLD 037-05-3938 (RI) b. 07 Dec 1900 d. 24 Jul 1990. "United States Census, 1940," database with images, FamilySearch (https://familysearch.org/ark:/61903/1:1:KSJQ-W1K : 17 May 2014), Harold B Sawyer, Ward 1, Cranston, Cranston City, Providence, Rhode Island, United States; citing enumeration district (ED) 4-44, sheet 8A, family 173, NARA digital publication T627 (Washington, D.C.: National Archives and Records Administration, 2012), roll 3763. Herbert Arthur Sawyer was the son of George Frederick Sawyer and Mary Elizabeth Carleton. living at 44 Rockledge Rd., Newton, Massachusetts. "Massachusetts Marriages, 1841-1915," database with images, FamilySearch (https://familysearch.org/ark:/61903/1:1:N488-Y68 : 17 February 2016), Herbert A Sawyer and Thora M Johnson, 14 Apr 1906; citing , , Massachusetts, United States, State Archives, Boston; FHL microfilm 2,315,298. 1910 United States. Bureau of the Census. 13th census, 1910 population census schedules, Washington, District of Columbia: Bureau of Census Micro-Film Lab, ([19--?]) , Census Place: Newton Ward 5, Middlesex, Massachusetts; Roll: T624_603; Page: 1B; Enumeration District: 0971; ; FHL microfilm: 1374616. Massachusetts Vital Records, 1841-1910, , Vol: 400 ; Page: 319. National Archives and Records Administration (NARA); Washington, D.C.; Consolidated Lists of Civil War Draft Registration Records (Provost Marshal General's Bureau; Consolidated Enrollment Lists, 1863-1865); Record Group: 110, Records of the Provost Marshal General's Bureau (Civil War); Collection Name: Consolidated Enrollment Lists, 1863-1865 (Civil War Union Draft Records); ARC Identifier: 4213514; Archive Volume Number: 3 of 4. "Massachusetts, Marriages, 1841-1915," index and images, FamilySearch (https://familysearch.org/pal:/MM9.1.1/N4NF-W61 : accessed 11 Nov 2012), Horace A. Sawyer and H. Abbie Berry, 1867.